Angies List Super Service Award Winner 2014 & 2015. All Tools And Equipment Are Cleaned Between Services. 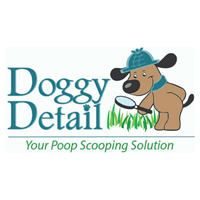 Doggy Detail is a professional dog waste removal service. We service residential and commercial properties such as single family homes, HOA's, Apartment/Condo complexes, gated and retirement communities. Established in 2004 and servicing over 425 customers weekly, we are continuing to grow and expand in the Chicagoland area. Doggy Detail has been an incredible service for me and well worth every penny to have them come each week and pick up after my large dog! Great job, the yard was clean and clear after your service. I would recommend and have recommended your service. With four dogs...a spring cleanup was not a chore we wanted to tackle! Thank you for doing a great job!! Spring cleanup. Great job. Even picked up dog waste in mulched area. Great job remove the dog waste all over my yard! Tech was on time and also sent text once they arrived. Service was very prompt and efficient.. I love the text and email notifications.. Signed up recently after being recommended off my village site. Have had the spring clean up and one regular visit. Absolutely love that I receive a text notification to let me know when they arrive and they doing an amazing job. Plan to keep them the rest of the summer and next! Excellent service and my yard looks great! It was probably a mess out there since December, and now you would never know it! Quick response and work was excellent! Stephan did and excellant job. Thank you. I went with the spring clean up and I am so thankful!!! Thinking about doing the weekly!! Your technician did a wonderful job with our back yard !! Sad that your company does not come to South Elgin on a weekly basis. Spring Clean Up. Only 1 dog but it was a L-O-N-G winter! Somehow they picked up Everything! Now they’re scheduled for weekly service. I’m beyond happy with the service! Excellent job and the best part I didn't have to be home. I recommend them and yes I will use them again. Very unhappy with the customer service! I would not recommend them to anyone ! This company is wonderful and they always do a great job. Best investment I make every week! First visit this morning... did a great job! Thanks! Doggy Detail has been a wonderful service for us since we are older and have 3 dogs. They always show up and when finished they look the gate again. Great service beautiful job done on my yard. We have been using Doggy Detail for 9 years. It is a wonderful service. People are friendly. If my dog is out in the yard they play ball with her. I have never had a problem. Excellent service! The text when the service arrives is great! So far, So good! This is only the second time we have used Doggy Detail. Ryan is always pleasant. I did not like that I got charged when I got call for service but could not answer. Yes everything is fine thank you. Doggy Detail always does a great job of cleaning up the yard. Very nice and caring people. Very happy with their service. Thank you. He shows up every week at the same time and gets the job done. wonderful timely service always ! Doggy Detail does a great job meeting my dogs needs. Always dog friendly people doing the work & consistently keep to the schedule.